In 1949, Zion Benton Township High School held its first homecoming parade, on the 10th anniversary of the opening of the school. The entire community got involved, and it was such a success, it was decided to have a parade every year. 1951 marked the 50th Anniversary of the founding of the City of Zion, so rather than having a homecoming parade, it was decided to call it the “Jubilee” Parade. The Chamber of Commerce sponsored the event and the Jubilee Days Festival was born. Since 1951, the Zion community has continued the community celebration held annually on Labor Day Weekend. The Chamber of Commerce continued to sponsor the festival for about 30 years but it became too costly. In an effort to keep the tradition alive, a group of concerned citizens, along with Zion Park District, held fundraisers and worked tirelessly to preserve it. In 1983, Jubilee Days Festival, Inc. was formed as a not-for-profit corporation. 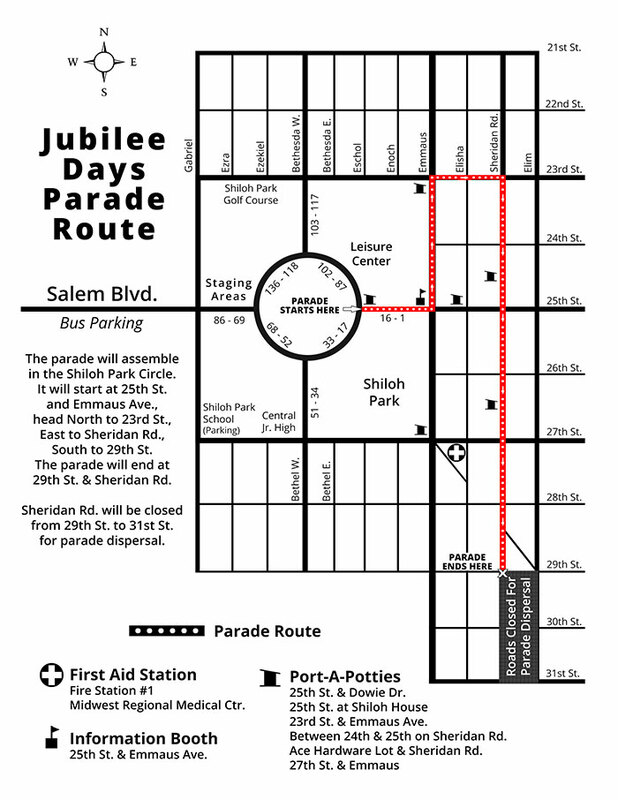 In 2003, the Zion City Council passed Resolution 03-R-02 creating the Jubilee Days Festival Commission as a City Commission. Commission members are challenged with producing an event of historical, social, and civic significance. The Commission is charged with providing opportunities for broad-based involvement by a variety of political, financial, social, and civic organizations in order to uplift patriotic, spiritual, and moral values to families and community. The Jubilee Days Commission has 12 members. One member represents each of the following organizations: City of Zion, Zion Township, Zion Park District, Zion Police Department, Zion Chamber of Commerce, Zion Benton Township High School, and Zion Benton Ministerial Association. Five “at-large” members complete the roster of twelve. The Mayor appoints all members with approval by the Zion City Council. All members are appointed for a three-year term. The Commission elects a President and a Secretary/Treasurer and appoints an Executive Director. The Jubilee Days Festival Commission holds regular meetings ten (10) times annually. The meetings are held on the 4th Monday of each month (except November & December) at 12:00 noon at the Zion Park District Leisure Center. 12 members with 3 year staggered terms. Membership appointed by the Mayor and approved by the City Council. Provided by Resolution 03-R-2. The Parade steps off, as always, from Shiloh Blvd. (25 St.) and Emmaus Avenue and heads north to 23rd St. It then turns East on 23rd to Sheridan Road and will proceed South on Sheridan, ending at 29th St. Questions can be directed via email to paradechair@zion.il.us or by phone to 847-477-0677.